The Guru my meeth, my friend, has sunaaeeaa, has told me, made me understand, made me listen to kehaaneeaa, the kehaaneeaa, the stories, the kathhaa, the sermon, the Divine stories, the Divine stories of Waheguru, of Akaal Purakh, of Hari, of Satguruji. balihaaree gur aapanae I am balihaaree, I am a sacrifice to aapanae, to my Guru, gur aapanae, to Guru Sahibji, to gur ko bal jaaeeaa. Bal jaaeeaa means that, over and over again, I am a sacrifice to my Guru, gur ko bal jaaeeaa. aae mil gursikh aae Oh join together, Oh Gursikh! Oh, mil gurasikh aae mil thoo. The Gursikhs who join together, who obey the Guru with their hearts and soul completely, mil thoo maerae, Come meet with me! Guroo kae piaarae, because You are beloved, You are loved by the Guru, the Hari. Guru Ram Das ji says, Pause and think about this. The gun, the virtues of Hari, of Waheguru, har bhaavadhae, are pleasing to Waheguru. But Satguruji says, Where do You find them? Sae guroo thae paaeae. They are only found through the Guru. Those people who have ma(n)niaa, who have accepted, who have loved, and who have followed the gur kaa bhaanaa, the words and the will of the Guru, who have followed out the instructions of Guru, thin ghum ghum jaeae. I am a sacrifice again and again. thin ghum ghum to those people who follow the words of the Guru completely. Even though I have just seen dhaekhiaa, just seen Satguru, my beloved, piaaraa, I am vaaree, I am a sacrifice to those as well. Those who have done chaakaree, have done the seva of the True Guru, the selfless service of the Guru, I am balihaaree, I am a sacrifice to them as well. Oh Waheguruji! You are har har thaeraa. Har har is Waheguru, Waheguru, Waheguru. Hai dhukh maettanehaaraa. You are the destroyer of all pain, any pain, whether it is mental, spiritual or physical. The Naam is the Destroyer of all pain. Dukh bhanjan tera naam ji dukh bhanjan tera naam This is in Guru Granth Sahib ji. Guruji says, How can you find nisathaaraa? How can you find liberation? Only by being a Gurmukh, by following the Guru, in peace and in war, in pain and in happiness. We must follow the Guru, and gur saevaa, and serve the Guru. Then you will find nisathaaraa, then you find liberation. Those jan, those servants, who har naam dhhiaaeidhae, who meditate upon the Naam, the name of Waheguru, thae jan paravaanaa, are accepted into the Court of Waheguruji. Naanak is vaariaa, is a sacrifice to them, sadhaa sadhaa, again and again, again and again, to those Gurmukh piaaree, who mediated upon the Naam. Oh Waheguruji! Even Your praises, Waheguru, only those are Your praises, which You want to be Your praises. This line is meaning that even if you are going to praise Waheguru, that only happens with His kirpa, with His grace. Those people who are His Gurmukhs, who follow the Guru through thick and thin, who follow their Beloved, their piaaraa, they har fal paavai, they find the fal, they find the fruit. What gift do they get in return? What do they get in return? They get har, they get Waheguru as their reward. Those people who serve their beloved, they get Waheguru. They find Waheguru as their reward. As the fruit of all their dhhiaaeidhae. Those people who are pireharee, who have complete love with Hari, with Waheguru, thinaa jeea prabh naalae. Their jeea, their souls, are always attached to Waheguru. In fact, they are delved into Waheguru. They are jeevadhae, they are only able, they are only alive if they jap, they jap, if they are doing jap for their piaaraa, their beloved. If they cannot do jap for their Beloved they say: If I am mediating upon you Oh Waheguru, then I am allowed. If I am not, then I am dead. Har naam samaalae. For this reason they say naam samaalae. They meditate upon the Naam of Waheguru, all the time. oue aap shhuttae. They liberate themselves. Paravaar sio sabh. They liberate their families. sabh jagath shhaddaaeia. They end up liberating the whole world. gur piaarai, the beloved Guru, living in this world and saving all of the souls, who have done saeva of Waheguru, of Akaal Purakh(u), of Ik Oaankar. Gur Dhha(n)n Gur Dhha(n)no. Blessed is the Guru, blessed is the True Guru who has done this great saeva. Who brings us from the darkness into the light. The Guru has dhasiaa, has told his piaaraa, Gursikh, the maarag, the path to Hari, to Waheguru. gur pu(n)n vadd pu(n)no. The Guru has done the greatest good that could ever been done in the world, in the universe. Those people, who gur saevadhae who do saeva, who do selfless service of the True Guru, sae pu(n)n paraanee. They are pu(n) paraanee. They are blessed paraanee. They are blessed beings. And Guru Ram Das ji says, I am vaariaa, I am a sacrifice to those people, sadhaa sadhaa, again and again. Doing their saeva of the True Guru. guramukh sakhee sehaeleeaa The Gurmukh friends sae aap har bhaaeeaa. They please Waheguru, they please Hari with their saeva. When they painaaeaa, when they go into har dharageh, into the Court of Waheguru, then they are painaaeaa, they are blessed by Waheguru. Har app gal laaeeaa, Waheguru, Himself, takes them into His embrace. Har app gal laaeaa. Guru Ram Das ji says, Please given me the dharasan, the blessed vision of those Gurmukhs who naam dhhiaaeidhae, who meditate upon the Naam. They never remember Waheguru. Har har kadhae n chaethiou means they never remember Waheguru. Jam pakarr chalaaeaa, Jam the Messenger of Death, m pakarr, gets hold of them, and n chaethiou, and takes them away. Thin jam, Death cannot come near to them (naerr n aavee), because Gurasikh gur piaarae. Because they are Gursikhs. har kaa naam nidhhaan, Waheguruji’s naam, is the True treasure. Hai koee guramukh jaanai. Only a few Gurmukhs know this. Oh Naanak! Those people who have sathigur bhaettia, have met the True Guru, ra(n)g raleeaa maanai, they are blessed with complete peace, ecstasy and happiness. Satguru, the True Guru, is the True Giver (dhaathaa) of Everything. Thus karae pasaaou. He grants His complete grace and mercy to the Gursikhs. I am vaariaa, I am a sacrifice to the Guru, Who has vittahu, Who has given me the Naam, Sat Nam, Siri Waheguru. How blessed is that Guru, guru saabaas hai! How great is that Guru hai hara dhaee snaehaa, who gives me har dhaee sanaehaa? Who gives me the Blessed Word with the sanaehaa, with the message of Waheguru. The message of naam simran, the message of chardi kala. ho vaekh vaekh guroo By looking at the Guru again and again, vigassiaa, I am blessed; and my soul is in complete ecstasy when I see the Guru. 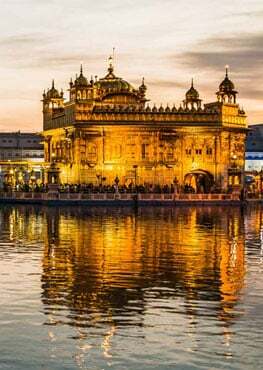 Gur sathigur dhaehaa, when I see the embodiment of the Guru before me, Sri Guru Granth Sahibji before me, the panth piaaree, the Khalsa panth, when we see the Guru standing before us. Those Sikhs who have sought and who have listened to the gur ma(n)niaa, and have accepted it, thinaa bhukh sabh jaavee, all of their dhukh, all of their desires, all of their hungers will go. The maarag, the path of Hari, of Waheguru, aakheeai kahu kith bidhh jaaeeai. How can you walk on that path, Guru Ram Dasji asks? The naam of Hari, the naam of Waheguru, we should take that as our prize! Hai har kahrach lai jaaeeai, and set out on this path. That is how we should leave. That is how Guru Ram Das ji understands we should walk on this path. The Gurmukhs who have followed the Guru completely and have aaradhhiaa, have meditated upon Hari, upon Waheguru, sae saah vadd. They are truly rich, and they are dhaanae. They are truly wise. I am sahd. I am again and again vaariaa, a sacrifice to the Guru, to the True Guru, gur bachan samaanae. I am samaanae. I am listening to the words, bachan, of the Guru. Oh Waheguru! You are the Master of all. You are my Lord and Master, thoohai maeraa meeraa. You are my meeraa, meeraa means King. You are my King, Waheguru! thudhh bhaavai, If it pleases you, only then will you get someone to repeat, ba(n)dhagee, your simran, your Naam. You will bless someone with Nitnem, You will bless someone with Naam, That is someone with a(m)mrith vela, that is someone with the Naam, thaeree ba(ndhagee. Thoo gunee geheeraa. You are the geheeraa. You are the the treasuure of all gunee, of all virtues, of all blessings. Waheguruji, You Yourself are har eik. You are One. You Yourself are ra(n)g hai, You are all colors. You are One form, and You have many forms. You are Ik Oankaar and eik aapae, eik aapae. Eik aapae, eik aapae. Guru Granth Sahib Maharaj is saying, Eik aapae, Eik apapea, You have many forms but only One form. Ik Oaan-kaar. And in the end Guru Ram Das ji says, anything which bhaavai, anything which pleases you, Oh Waheguruji, that bachan, that word, that thing, that blessing, that blessing, that is complete, That blessing is a gift to the world, and that blessing is a blessing to the world. Guru Ram Das ji is telling us that we must as Gursikhs meditate upon the Guru?s words. So Guru Ram Das is saying to us today, those Guruskihs who are blessed by the Guru, they find everything. Waheguru ji ka Khalsa ! Waheguru ji ki Fateh ! !